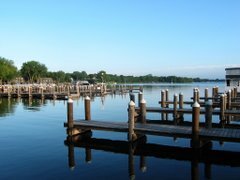 In the 1960s and 1970s Lake Minnetonka experienced horrible pollution. There were six sewage treatment plants discharging their effluent directly to Lake Minnetonka and, after years of operation, the lake had become so polluted that algae caked the water surface and as it rotted, it stunk to high heaven. This was bad. Lake Minnetonka had become a local cause célèbre and the community response, which mirrored a national and international response to similar problems elsewhere, corrected the problem. As a result of many local and national efforts, we now have the Environmental Protection Agency, we no longer discharge sewage effluent into Lake Minnetonka and when sewage is discharged into the nation’s waterways, it is treated. Lake Minnetonka’s water quality has gotten steadily and significantly better over the past several decades as a direct result of removing sewage discharges. This is good. Lake Minnetonka now faces a similar tidal change. Aquatic invasive species (AIS), if allowed to become established in the lake, will cause damage greater than what the lake experienced a half century ago. The difference this time is that 1) we can see this coming and 2) once in the lake, we have no way to reverse or remedy the damage. Lake Minnetonka is highly exposed to AIS introductions. Lake Minnetonka has dozens of access points. Lake Minnetonka welcomes hundreds of thousands of boaters each year. Boater knowledge of and actions to clean their boats and trailers is high, but not high enough. Insufficient prevention actions include inspectors (covering about 20% of the public access hours), video monitors (which are not reviewed) and special event participants (who are not inspected). The Lake Minnetonka Association, the LMCD and other agencies have stepped up their efforts recently – yet we remain highly exposed. Minnesota Waters, the state-wide advocacy organization, has recently adopted a position paper and recommendations on AIS in Minnesota and has found the state’s AIS management system to be broken. Simply, Minnesota has a highly permissive system that hangs on to a long-standing cultural ethic of free access to our lakes and rivers. Unfortunately, AIS moving mainly on boats and trailers exploit this. Unless we find some way to reconcile this dilemma, and soon, Lake Minnetonka and many other lakes will be forever changed. The Minnesota Waters paper also found AIS infestations and impacts to be accelerating. We have more lakes and rivers becoming infested, we have more kinds of exotic species in and entering Minnesota and the impacts are increasing. For example, zebra mussels in Lake Ossawinnamakee are now at densities of hundreds per square foot. Zebra mussels are growing in places where it was once thought they would not grow – on soft bottoms and on plants. The entire ecosystem in Lake Ossawinnamakee is damaged. We must change the way we approach protecting our lakes and these changes must be considered locally (for Lake Minnetonka) as well as state-wide. If this sounds like a large challenge – it is. However, we must find ways to confront this challenge if we are to protect the lakes we love. Minnesota Waters has made recommendations to change this AIS management system. The Lake Minnetonka Association, in our Milfoil-Free Minnetonka campaign, has made recommendations to protect Lake Minnetonka. The Lake Minnetonka Association, the DNR, the LMCD and other agencies have begun developing a comprehensive prevention plan for Lake Minnetonka. This plan, scheduled to be implemented in time for next season, has so far adopted a goal of reducing the risk of an AIS introduction to Lake Minnetonka by at least 90%. This is aggressive, but so are AIS. Unless our state and local leaders confront these challenges, the tides on Lake Minnetonka could be forever changed.